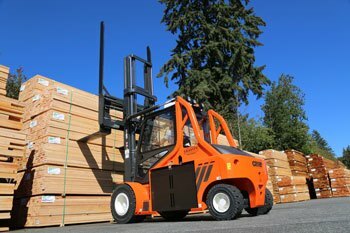 VANCOUVER, CANADA – Another leading home and building supply company in the Pacific Northwest switches their entire forklift fleet from LPG and diesel to electric. At the foundation of this company’s sustainability vision is a true passion to leave their impact on the environment better than when they started. This guides the business through every decision it makes, both through their various innovative solutions and how they conduct themselves personally in their communities. Whether they are making changes in their manufacturing process to have their products last longer (thus reducing the need for early replacement), or looking toward partnering with suppliers that share in their environmental sustainability vision, this leading manufacturer takes their environmental responsibility extremely serious. It has become the new marketing trend for many corporations to publish their “greening” initiatives, yet few are actually standing behind their claims showing real measurable actions taken to prove such results. Those companies that are standing behind their commitment know one of the easiest decisions to make is not only an environmentally responsible decision, but one that also has a proven cost reduction. Switching your forklift fleet from internal combustion engines (ICE) to electric is the easiest way to achieve both of these goals. 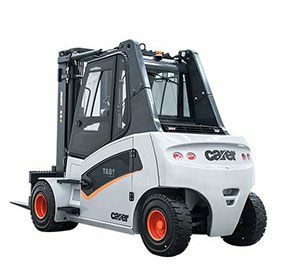 The Carer electric forklift dealer in the Vancouver region of British Columbia, Leavitt Machinery, was asked to consult on the potential for replacing the propane and diesel forklifts and they were able to secure a sale for seven of the Carer F70HD units (15,500lbs lift capacity). Working through the application details, Leavitt Machinery reached out to Eric Halfnights, Business Development Manager of Carer Electric Forklift Solutions to provide support with application analysis. Following are the results in working through the analysis process. This manufacturer of home building supplies operates 12 machines ranging in size from 5,000lbs to 20,000lbs. They traditionally averaged 2,000 hours of use per year and had increasing costs in maintenance, fuel, tires, insurance, and the numerous intangibles associated with the management of these operating costs. Along with their increasing maintenance costs, they also started a downtime program that created the need to fix major components and have numerous rental machines taking the place of the machines that were down. Organizing major forklift repairs, dealing with rental equipment, and absorbing issues surrounding forklift downtime started to require significant management time that would otherwise be focused on their core business of manufacturing. This is what started the need to look for innovative solutions. The most important stage in working through the analysis process is understanding at what point you are starting from. The most basic of all management fundamentals is, “You can’t manage, what you can’t measure.” Without understanding where you are today, how will you ever fully understand the achievements, or otherwise, of changes that might affect the future? This is the approach Carer Electric Forklift Solutions takes with every application. 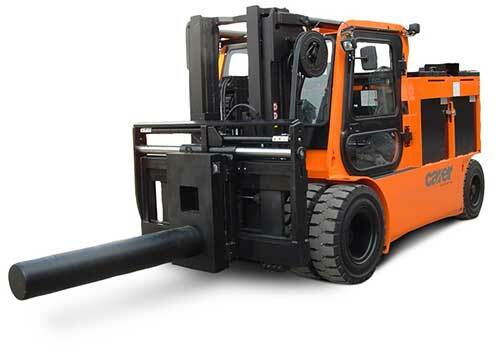 In this case, the customer was excellent in providing the needed information to fully determine what was recognized as true operating costs for their current forklift fleet. When considering all calculated cost inclusions and taking a very conservative approach with forecasting, the Carer F70HD forklift was able to reduce forecast monthly operating costs for the forklift fleet by 16.4% vs the diesel units currently operating. 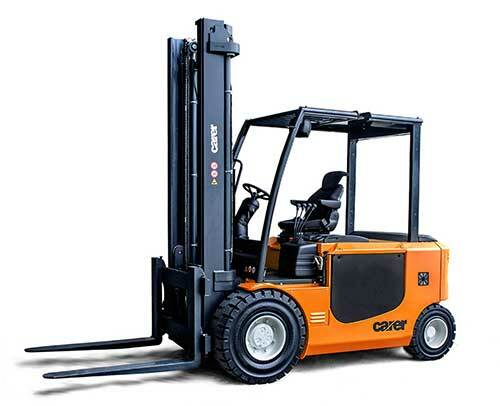 The Carer electric forklift was also able to exceed the environmental impact goals by eliminating all carbon emissions. The biggest concern with this customer’s application was the ability for the power system, including the battery and charger, to have sufficient output for daily operation. To address this Carer focused on analyzing how the diesel trucks in the current application consume fuel. This diesel energy consumption was then translated into the equivalent electrical energy consumption so the power system output capacity requirement could be determined. This was then compared against how some of their models consume power in similar applications to audit for potential miscalculations. 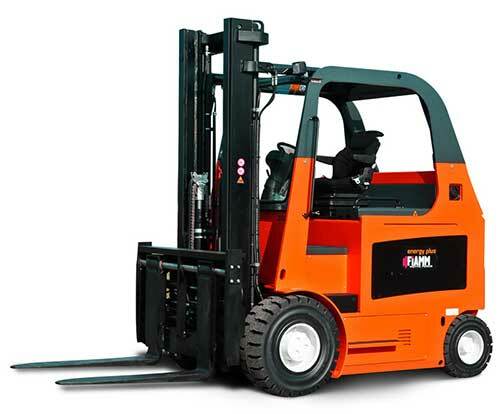 A variance of 20% was then added to the required battery capacity to ensure a safety factor was included for daily fluctuations with forklift operating time. Carer and Leavitt Machinery determined that supplying the F70HD model, which has a 96-volt operating system, would be sufficient. The higher voltage operating system consumes much less battery power as the truck operates more efficiently and provides the ability to operate for much more time on a single battery charge. However, as the application has variable daily demands operating over two shifts, Leavitt Machinery also included an opportunity charge battery system where the operators will simply plug the battery to the charger during lunch breaks and coffee breaks. Carer was also able to direct Leavitt Machinery to government funding opportunities to source and review government subsidies available for their client. As it happens, the province of British Columbia is actively supporting carbon emission reduction strategies and this project fit perfectly within this government program. Leavitt Machinery was able to secure a significant government rebate for the units sold. However, as the rebate was an unknown possibility, it was not included within the financial justification for the sale and therefore would have supported a further increase with monthly operating cost savings. Carer actively pursues and consults on all available government funding throughout the USA, Mexico, and Canada. Carer has 46 different electric forklift chassis options available ranging from a 12,000lbs lift capacity up to a 36,000lbs capacity with extended load centers. 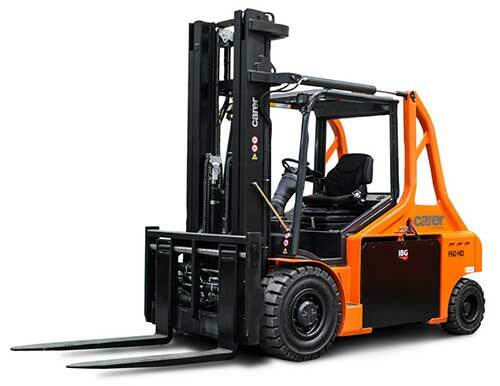 R45-80H2 series including: capacity ranging from 9,900lbs up to 17,500lbs with an 80-volt chassis configuration and all-weather cabin options. This Carer R series range is great for manufacturing and processing facilities including freight loading and container loading. F60-100HD2 series including: capacity ranging from 13,500lbs to 22,000lbs with a 96-volt chassis configuration, high-performance dual drive motors, and a short turning radius 180-degree steer axle. The Carer FHD2 series is excellent for performance and energy demanding and high daily utilization environments including lumber processing and reload, pulp and paper processing, and any environment where performance and long operating time are required. A80-100X series including: capacity ranging from 17,500lbs up to 22,000lbs with full rated capacity available up to 19.6ft, a 96-volt operating system for high-efficiency energy consumption and long operating time, high-performance dual drive motors, elevated seating position, large diameter super elastic tires, and all-weather cabin options. This series is a great fit for steel, lumber, and multi-pallet handling applications. Z60-100H series including: capacity ranging from 13,500lbs to 22,000lbs with a 96-volt chassis configuration, high-performance drive motor, short wheelbase. Great for operation in dense warehouse and production environments. Excellent in paper roll industries. K100-120 series including: capacity ranging from 22,000lbs to 26,000lbs with a 96-volt chassis configuration for high-efficiency operation. Very low chassis and mast design of 88” for operation in environments with limited height access including shipping containers, mining, heavy industrial, and port terminal operations. All-weather cabin options available. Z100-Z140HC & Z140-160H series including: capacity ranging from 26,000lbs to 35,000lbs with a 120-volt chassis configuration for very high operating efficiency, cushion tires, short wheelbase for confined area operation, excellent for applications with steel coil and smelter facilities, aerospace, and heavy-duty manufacturing. 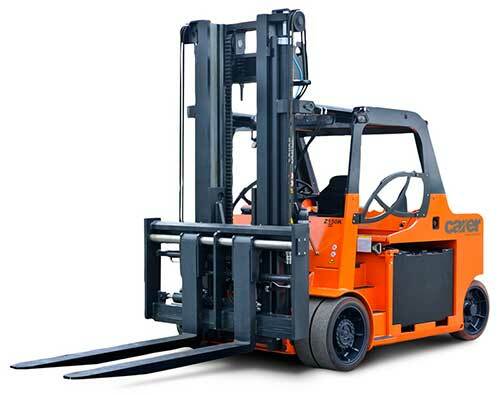 R120-160 series including: capacity ranging from 26,000lbs to 36,000lbs with a 120-volt chassis configuration for very high operating efficiency, large diameter super elastic tires, heavy-duty drive systems, all-weather cabin options. Excellent for port terminal operations, lumber reload yards, steel coil handling, heavy load pulp clamp, large load freight for agriculture, automobile manufacturing, and many other heavy industry applications. Carer electric forklifts has the right machine for any heavy-duty application in the most aggressive operating environments. 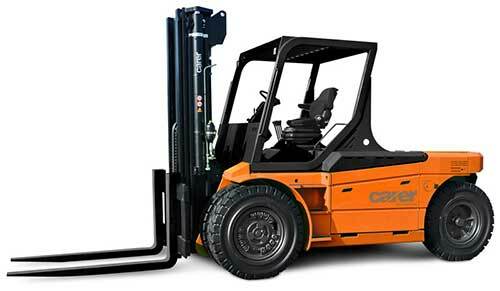 Please contact Eric Halfnights, Direct of Business Development at 1-844-33CARER (1-844-332-2737) for information on how Carer can support the integration of industrial electric forklifts into your facility.